This 90 minute workshop immerses participants in a 24-channel ambisonic audio/visual installation, allowing them to explore the relationship between physical gesture, sound and place. 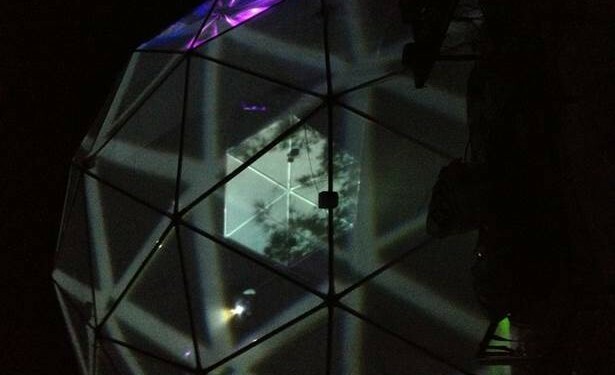 Set within a 6m (diameter) geodesic dome, participants will be able to explore two audio/visual artworks: SoundLabyrinth and Action A/V. Gesture analysis within each of the installations operates on a number of levels, including spatial position and motion tracking, effort type and posture recognition for setting overall sound content and global parameters, as well as direct gestural control of specific sound and vision manipulation mechanisms. Participants will have the opportunity to investigate the gestural recognition and control mechanisms used in the installation, and reconfigure the interaction system in order to gain an understanding of the practical relationships between movement, sound and vision at the software and hardware level. Mark Pedersen is a Melbourne-based artist working primarily in sound and image design. He has a PhD in computational linguistics and is currently completing Masters research on the topic of sacred sound at the Victorian College of the Arts, University of Melbourne. He has spent time in India and the Middle East, and as a computational linguist with a focus on symbolic approaches to syntactic analysis, he has made contributions to computational grammars of Hindi and Arabic. His concerns as an artist centre around the intersection of human activity and the Divine, with particular reference to embodied cognition, improvisational performance and gestural interfaces which better enable the performer to ‘fuse’ with their performance environment. His work has been performed in Australia, Japan, Europe and India. For examples of his work go to www.chailight.com. Roger Alsop is a Melbourne-based audio/visual artist and educator. He has a Masters in Computer Music Composition and is currently undertaking PhD research on translating text, motion and visual art to audio/visual installation works. As an artist, his focus is on the links between artforms and art-making processes, and in exploring and developing points of meeting and convergence between cultures and locations. As an educator he is interested in developing conceptual and technical skills that allow artists to confidently question their world and express their answers with skill and technical excellence. His work has been performed in Australia, Asia, Europe and the USA. For examples of his work go to sites.google.com/site/rogeralsop/. Participants: any skill level; participation does not rely on coding skills, however a basic understanding of interactive audio/visual systems will be an advantage. Those familiar with audio/visual patching languages such as Max/MSP or PD will be able to go deeper into the technical aspects of the workshop. Participants are encouraged to visit the installations prior to the workshop, to experience the works themselves before getting underneath the hood. Participants must bring a willingness to move about and experiment. Laptops with Max/MSP installed could be used for those interested in immediately applying techniques used in these installations.